Set the table and gather ’round for a big bowl of this Whole30-friendly Italian Harvest Soup! When the air turns chilly and the wind starts to blow everyone in my family loves to tuck into a steaming bowl of soup made with simple ingredients and nourishing broth. 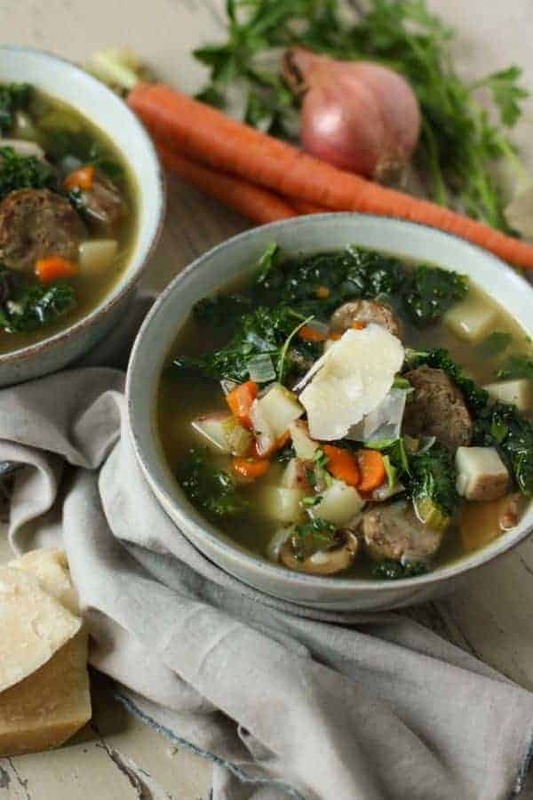 This Italian Harvest Soup originally appeared in the Winter edition of our now retired Simply Nourished 14-day Real Food Reboot book and quite frankly, I’d forgotten just how comforting and delicious it was until now! 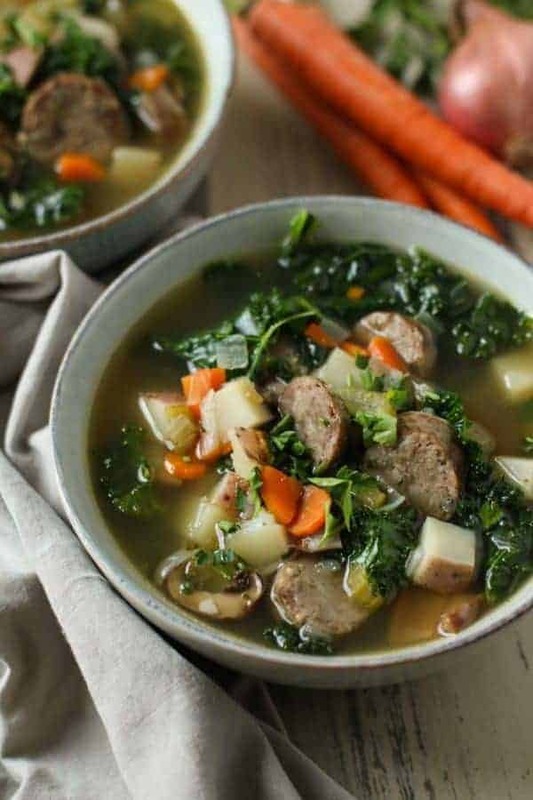 I’ve affectionately termed this soup “harvest” soup for the simple vegetables it features – potatoes, carrots, mushrooms, kale and onions. These are typically the last crops to come in before the first hard frost of the season. However, many of you may be sitting on piles of winter squash, turnips or chard so feel free to substitute some of these for the vegetables listed in the recipe. What really makes this recipe shine is the Italian sausage so don’t skimp there. I’ve used a mild sausage here but you can certainly use a hot Italian sausage if that’s your thing. If you’re looking to keep this Whole30-compliant, just be sure to read the label on the sausage to be sure it’s sugar-free. 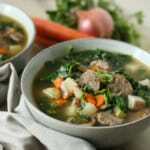 You can also use bulk Italian sausage that you’ve crumbled and cooked in a skillet before adding to the soup. I think that there is nothing better than a freezer filled with pre-made soup during the cold winter months so I suggest doubling this recipe and freezing half for another meal. If you pack a lunch each day, consider packing the cooled soup into small freezer-safe containers with lids to create individual portions that can be defrosted in the fridge overnight or by submersing them in hot water for a few minutes. I love glass mason jars for this purpose so I don’t have to worry about questionable substances leaking from the plastic into the soup. Just be sure to use the pint and half-pint jars for freezing as larger jars are prone to breaking when frozen. To reheat, simply pour thawed soup into a small pan and heat over medium-high heat on the stove until hot (or toss it in the microwave if that’s your how you roll). Soup can be a comforting and welcome change to your lunchtime routine when you’re tired of cold sandwiches and salads. An insulated thermos container is great for those without access to a kitchen and if you preheat the container with boiling water before adding the hot soup, you’ll be guaranteed to have a warm meal to ward off any chill in the air. Though incredibly glorious if you’re not avoiding dairy or doing a Whole30. 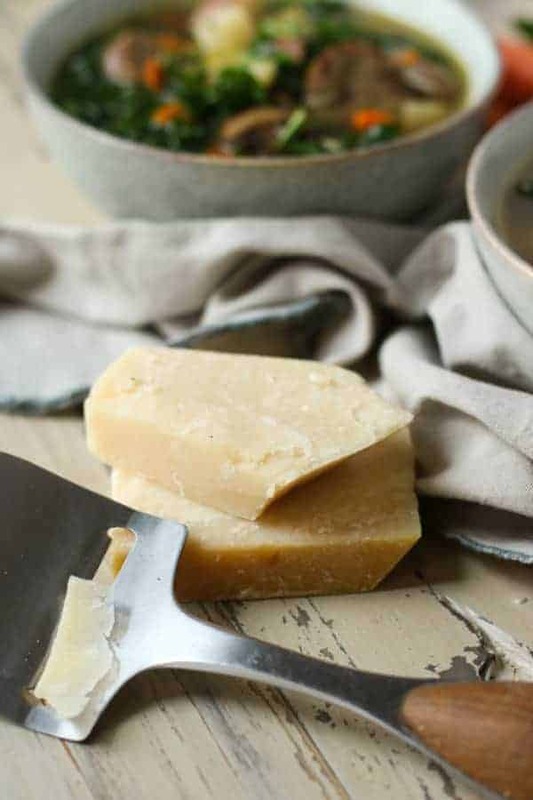 Just a few sprinkles of salty parmesan is all you need to take this soup over the top. Don’t wait another day, this Italian Harvest Soup needs to on your table and in your bowl! 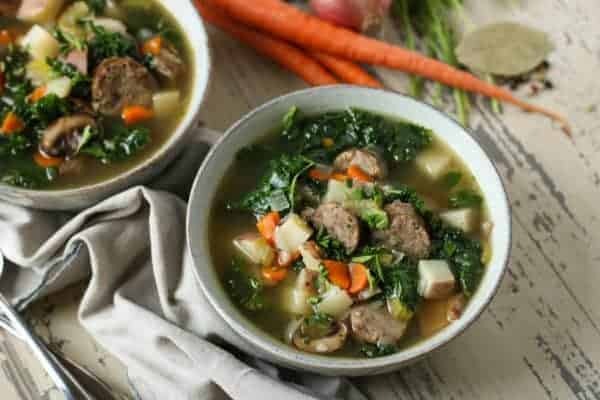 A warming soup featuring hearty fall vegetables and sweet Italian sausage for a warm and satisfying meal. Feel free to double this recipe so that you have plenty of leftovers to enjoy in the days to come or to have on stock in your freezer. Place a large pot over medium-high heat and add ghee or olive oil. When oil starts to shimmer, add onions, carrots, celery and mushrooms and cook, stirring occasionally, until onions and mushrooms are soft (about 8 minutes). Add garlic, Italian seasoning and black pepper and continue to cook an additional 30 seconds or until fragrant. Add broth and potatoes and bring to a boil. Cover, reduce heat and simmer until potatoes and carrots are tender, about 25-30 minutes. While the soup simmers, cook sausage links in a skillet. Cool slightly then slice into rounds. Remove from heat and serve with chopped parsley and/or parmesan cheese, if desired. What’s your favorite soup? Share in the comments below! Hi, This looks great. Can you update it for an Instant Pot? I fell in love with mine last winter and make all my soups and stews in it exclusively now. Thanks for the suggestion. Next time we make this soup, we will try it in the Instant Pot. I’m tying in instant pot duo right now! I sauteeed eveeythung together from step 1 and 2 and just added the potatoes and broth 🙂 I put it to cook for 15 minutes and then will add the meat and spinach! Hope it turns out! Hello. I just started following the Whole30 this past week. This is the perfect time of year to try this soup. I’m curious also what this might be like with leftover rotisserie chicken instead of the sausage in the event that I am not able to find sausage without sugar or preservatives. What about spinach instead of Kale? (not a kale fan) Would that have a huge impact on the nutritional value? I haven’t tried the soup with rotisserie chicken but my guess is that you’d want to add more spices to the soup to make up for the spices you’d get in the sausage. Spinach is a fine substitute for the kale but it’s not a hardy so I’d suggest adding the spinach to your bowl of hot soup rather than the pot. Subbing chicken for sausage will likely decrease the calories and fat in the recipe. If you need that specific info you can plug the recipe with your changes into My Fitness Pal (which is free and takes just minutes to use). Hope that helps! The ingredients say ghee, but the instructions say olive oil FYI…I’m sure it doesn’t matter! Making it right now and can’t wait to try tonight. Sorry about that – the ingredients were supposed to read: Ghee or olive oil. I’ve updated it – thanks for the catch! This soup is absolutely delicious, hearty and everything you want when you’re craving goodness~! This was a great recipe. As always, I add more veggies than the recipe calls for and it was amazing. I was really surprised at how much flavor the crimini mushrooms added to each spoonful. And kale was a great, hearty choice for greens. If you like spicy food, I highly recommend putting in a good hot sausage. I LOVE your recipes…some of the best out there. Keep up the great work! This is such a great review and we really appreciate it – it’s exactly why we do what we do! I love the idea of adding more veggies anywhere you can – and using what you have on hand. And yes to hot sauce – hot sauce makes everything amazing. This soup is so good! I am making it again this weekend and can’t wait. Thank you for an awesome recipe! Hi, the family and I loved this soup! I did add cubed zucchini for about a 1/4 of the potatoes. I doubled the batch and added half a can of coconut milk at the end…AM-AZE-ing! yum thanks. That sounds amazing! Glad you and your fam enjoyed this recipe! Thank you for the healthy soup recipes. I will make the harvest soup this afternoon.